Cassini was about 2 million kilometers (1.2 million miles) from Saturn when it took this picture, so we’re seeing a decently wide-angle view. 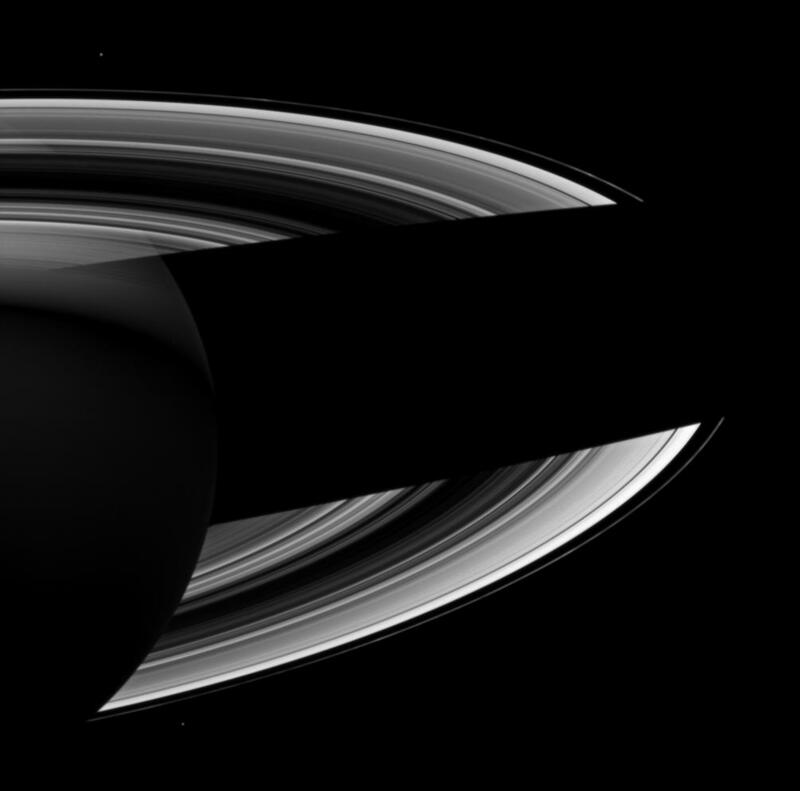 At the time, the spacecraft was below the plane of the rings, looking north (up, if you like). The Sun is off mostly to the left and up a bit. The first cool thing is obviously the shadow of the planet itself cast on the rings. It cuts across like a black scythe! As I looked at the picture my eyes and brain kept trying to fill in the missing arc of rings, which was amplified by a slight afterimage as my eyes moved around. It’s a difficult illusion to ignore. Second, I love how you can see all the different rings in the picture, including the thin, lumpy F-ring outside the main band. The big gap is called the Cassini Division; it’s not really an empty space since there are many faint thin rings inside it. They’re just hard to see here. The Cassini Division is fairly easy to spot even through a small telescope, looking from Earth like someone took a knife to the rings and sliced them. Third, you can see the tiny moons Janus (below the rings on the left) and Epimetheus (above the rings on the left) as well. I wonder how hard it is to get a picture like this without seeing any moons in it? Saturn has quite the fleet of them. Fourth, look to the left, just where the inner arc of the rings cuts across Saturn. You can see the planet right through the rings! The rings aren’t solid; they’re composed of gazillions of particles of nearly pure water ice. There are spaces between the particles, so we can partially see through them, like looking through a screened window. Fifth, and perhaps most cool of all: the part of Saturn we’re seeing here is the night side, entirely unlit by the Sun. The bottom (southern) part of Saturn is only noticeable by its absence! But what’s that glow in the north? That, my friends, is ringshine! Although this part of Saturn is in nighttime, the Sun is still shining on the rings (wherever you don’t see Saturn’s shadow across them). The ring particles are very bright and shiny. They reflect the sunlight, which then illuminates the northern hemisphere of Saturn. The southern half is still dark because the ice particles tend to reflect light back up, like a mirror. Since the Sun is coming from the north, that’s the way the light gets reflected. I’ll note that most of the light gets reflected away from Saturn, to the upper right in this picture, but enough is reflected back to make the cloud tops glow softly. This happens on Earth too, when sunlight reflects off the Earth and illuminates the dark part of the Moon. This is called Earthshine, also poetically called "the old Moon in the new Moon’s arms." It’s quite lovely. And it’s science! Which is lovely, too.